Google has been merging their products for a while now and promote the "one account for all" log in whenever you visit one of their websites (Gmail or Blogger, for example). However, the most surprising aspect of this One account. All of Google. collaboration is the merging of comments between YouTube and Google Plus. Using an example (see the image) from my own accounts, you can see how this works. I shared a video from YouTube via their social media buttons direct to my Google+ account. I wrote a comment about it, added some hashtags and shared to my networks (the #tf hashtag is part of the Friends+Me social sharing app). The video embedded itself into my Google+ account but also (and this is the important bit) the comments underneath the original YouTube video. The replies you can see are due to engagement on my Google+ account however the highlighted number 3 is the amount of +1s on Google+ and "likes" that my comment has received on YouTube combined. This also explains why some of my Google+ shares were receiving +1 notifications many months after I had posted them. 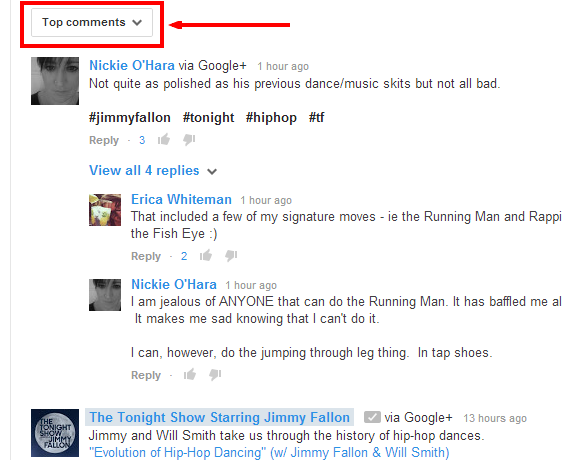 Users are "liking" my comment under the video which transposes into a +1 on Google+. My initial answer was "no" simply because I believe social sharing invites others to engage and experience. However, after a little bit of experimentation, it appears that the cross-commenting works both ways. If you comment directly from YouTube you can add hashtags and set your sharing to "Public" or specifically targeted circles and this will share the video, comment and hashags on your Google+ profile. I agree with some of Sarah's comment here now that I have conducted my comment/share experiment but I believe that the sharing via specific social networks very much depends on your individual activity and interaction on each network when it comes to view increase. My very abrupt response to this is "Hell, no!" The reason being is that not everyone uses their Google account to comment on blogs. In fact, there are still some people out there that don't (or won't) have a Google account. The reason for comments on a blog are to interact with the content there. The choice to socially share should be a separate one. It is also important to remember that your social sharing to Google+ depends entirely on which YouTube account you are logged into. Many people will only have one account (personal, in their own name) however bloggers and brands with Google+ pages will have (or be able to activate) a YouTube account connected to that Google+ account. I shall be picking up on this in a future post. In conclusion, there are many ways in which to increase your Google+ presence and authority but each "thumbs up" or +1 is another tip of the scales in your favour. If you want to be found, seen and heard on Google+ then why not use that to your advantage? I'd love to hear what you think about this in the comments. Circle me on Google+ - I'm +Nickie O'Hara.